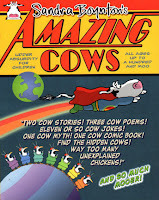 I couldn't have been more thrilled to hear that Sandra Boynton has just released another awesomely funny title Amazing Cows (Workman Publishing, $10.95). This new book overflows with amazing cows -- every kind you can imagine -- heroic cows, sensitive cows, edgy cows, cows on the moove and so much more drawn and written in a style that only Boynton can pull off. What makes me so excited about her latest book? The short answer is I'm a huge fan of fellow Baby Boomer Sandra Boynton since the 70s when I was in college out West and she was at Yale in New Haven. Over the years she's been referred to in the media and by the public as an author, a writer, an artist, an illustrator, a cartoonist, and greeting card maker. If you ask me, though, I'd say Boynton is simply one of the most brilliant creative talents who has ever lived and is one person both my generation and those before and after me all admire. This woman's energy is unbounded. Since 1973, Boynton has created over 4000 greeting card designs and sold more than 250 million of them. Then there's more than 40 of her bestselling books for children and 7 for adults, who are really just big kids, and four New York Times bestsellers. Between all these more than 20 million copies of her books have been sold. That is not even to mention four record albums for children -- including one nominated for a Grammy -- and 40 music videos that she's written and produced. After all that, her most recent work Amazing Cows is still just as fresh and hilarious as ever. This for sure is one book that I know my own kids will enjoy too. Meet Sandra Boynton, the author of Amazing Cows, in person at her only scheduled event to promote this new book. SATURDAY, DECEMBER 4 at 12 noon, Boynton will come in from the pasture with her book's characters for an appearance at Books of Wonder in New York City in the only event scheduled for Amazing Cows and you can be there! Dedicated to the subject of these beautiful bovines, the New York Times-bestselling author will be on-hand to first present a short musical revue and then a book signing at Books of Wonder (18 West 18th Street between 5th and 6th Avenue) on December 4 from 12-2pm. That's not all, currently Books of Wonder is hosting the first ever New York City gallery exhibition of Boynton's artwork (signed limited edition prints available). Don't miss out on the opportunity to introduce your own children to something so genuinely moo-ving. Adults who are Boynton groupies like me shouldn't miss this big bru haha either. For more information on the event, visit the Books of Wonder page. Here's an excerpt from the book, plus more details on the title are available on Workman's site. The Amazing Cows book giveaway, which is hosted by MommyBlogExpert and sponsored by Workman Publishing, is open to legal U.S. residents only. See details below. Contest ends January 31, 2011 at 11:59 PST. Leave a comment below this post to tell something funny or humorous that happened to you or your child. Remember to include your email address or Twitter contact info with your comment so that we may reach the winner. Keep in mind that this is a family-friendly blog, so keep it G-rated, please, otherwise your comment will be deleted. Be sure to leave an additional comment after you complete each optional entry action so that we can tabulate all your extra entries. FTC Disclosure: MommyBlogExpert received a copy of Amazing Cows to facilitate this review. In addition, Workman Publishing is providing the book for the giveaway contest. However, I did not receive payment or any other compensation associated with this particular post. See complete FTC Disclosure information that appears at the bottom of MommyBlogExpert's main page and at the bottom of every individual post on this blog, including this one. Something funny...hmmm...I have an identical twin sister. I went to a conference in high scholl and she didn't. I knew she wsn't there but I was in a room with tons of mirrors. I "saw" her from across the room and waved thinking to myself "what are you doing here?" Then I realized I had seen my own reflection. I still get picked on for that and it was about 15 years ago! I subscribe to our feeds. I went to my sister's house to play with my niece and nephew. After I left, I had to stop at Target and the grocery store. I did all of my shopping and finally got home. I took off my jacket and realize that my niece or nephew must have put minnie mouse ears in the hood of my jacket while it was hanging on the chair. I just thought of how ridiculous I must have looked walking around the store with these big ears sticking out of my jacket. When I was a child I was walking down my long driveway to my bus on an icy day and I totally wiped out and it knocked the wind out of me. A "big kid" had to come off the bus and pick me up and carry me to my seat! I follow Workman Publishing on Facebook.